The site is zoned to accommodate a mixed use building to maximize the sites develop-able floor to area ratio’s, offsets and building heights for this neighborhood. This 5 story steel and glass mixed use building with 10 residential live work apartment or condominium spaces, ground floor retail or office, 10 indoor parking spots and roof top deck. ZONING: The zoning of this property is a C2-3 Mixed Use Residential Zoning. 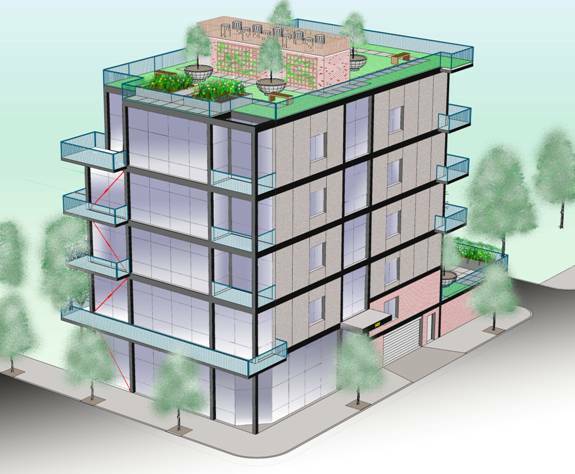 With C2-3 zoning it is a requirement that the ground floor be a commercial component, office, store front etc, but C2-3 will allow for residential condominiums, apartments or even hybrid live/work spaces on all the upper floors ( 2 thru 5). The zoning allows for a 3.0 floor to area ratio thus with a 5,000 square foot ( 50×100 lot ) a 15,000 square foot building with a 65” height limit is feasible on this site with this zoning. The rendering and floor-plans on this lot site have been designed specifically to maximize useable ( rentable or saleable) square footage on this site. 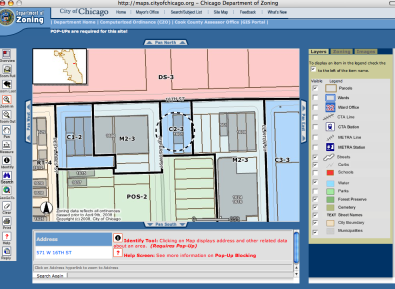 City of Chicago Zoning Map. The previous zoning of the property was manufacturing ( as are most the surrounding properties) significant value has been added by changing this property to a commercial mix use allowing a significant residential component to be developed on this corner lot.